I spent the last afternoon of 2009 playing some of the Columbia Blockgames that I've acquired over the last few years with Tom, Matt and Simon. 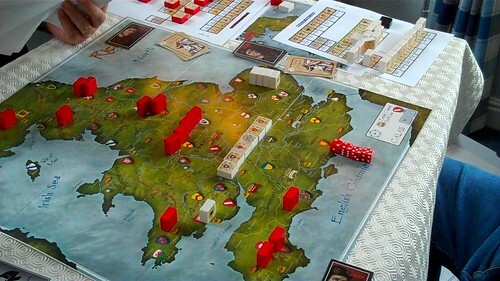 I took the whole suite of the games with the 'Hammer of the Scots' engine down with me; being 'Hammer of the Scots', 'Richard III', 'Crusader Rex' and 'Athens and Sparta'. The games are called 'blockgames' because each side's forces are on coloured wooden blocks, which have a sticker on detailing the unit. The blocks are arranged so the other player cannot see the details, a bit like 'Stratego', and their orientation indicates the strength of the block. The actual forces in a battle are only revealed when they make contact. After some discussion, we set upon 'Richard III' and 'Crusader Rex' to play, simulations of the Wars of the Roses and the Third Crusade respectively. Tom played Simon in the battle between the Houses of York and Lancaster. Tom had the Lancastrians and Simon the Yorkists. 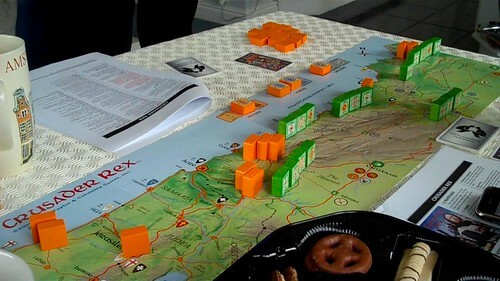 I faced off Matt as the Franks, led by King Guy of Jerusalem, and Matt lead the Saracens with Saladin front and centre. Both games went very well; the fog of war effect is fantastic (you can't see the exact piece or strength of enemy pieces until you engage them) and often leaves both players feeling that they are losing. In the pictures here you can see the view from either side of the Crusader Rex board. The view from my side of the board. I had my head comprehensively handed to me on a plate by Matt, all respect due, after I forgot one of the key strategic objectives of the game for a turn. Crusader Rex hangs around the control of seven key cities/areas in the Holy Land; Damascus, Aleppo, Antioch, Acre, Jerusalem, Tripoli and Egypt. The Franks start with 4 areas and the Saracens with 3. 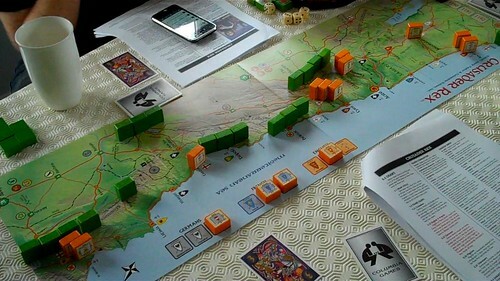 Victory conditions are either to hold the majority of the cities at the end of the last turn or 'sudden death' victory by gaining control of all 7 cities. It was the latter which undid the Frank's campaign. When Crusader Rex first came out, it was heavily criticised as being unbalanced in favour of the Saracens. However, the rules have since been amended, and the whole game feels finely balanced. Among the key things I learnt from playing were that storming fortified cities or castles was a very costly experience, even with large numbers of attackers. I guess that history reflects this. The Frank Knight's Charge is devastating when used, but can be self destructive with bad rolls or the addictive feel of throwing large numbers of dice takes control. The Crusader forces need to try and catch the Saracens on the field, or the losses in combat against fortified cities will completely undermine their long term survival. As the Frankish forces, you feel really exposed for the first few game years (each of which have 6 turns), as you constantly lose forces against the huge numbers of Saracens deployed at the start. I ended up clustering around some of the cities and locating some forces on key communication routes to stop a Saracen advance. However, this left the forces effectively pinned, with the Saracen forces able to mass and overwhelm the less strong enclaves at will. Slowly, my long, thin, defensive line was broken, with little clusters of orange blocks surrounded by green. The only bright spot on the horizon was the slow massing of Crusader forces from France, England and Germany, a growing threat which Matt was also very aware of. I thought the game was swinging back into my favour when Richard the Lionheart landed, with the Germans ready close behind, an event that coincided with the Saracens forgetting that the winter turn was next and failing to disperse forces to areas that could support them through the winter months, thus losing large numbers of units including Saladin himself. Unfortunately, that's when I made my big stupid mistake. I moved my massed forces from Acre and the surrounding roads to try to retake Jerusalem. The initial storming attempt failed to break the Saracens, so I settled in for a siege. At that point Matt launched a counter attack at the now weakened port of Acre, taking the city. Foolishly, I had failed to notice this was the last city in my control (as I was just about to launch big attacks on three others), and I lost the game! I really enjoyed the experience, and would love to play again. The feeling was the same from all the other players. We can wholeheartedly recommend the Columbia Blockgame Experience. It's great to actually be on holiday now, even if it brings with it a flurry of preparation for Christmas. Jill finished yesterday, and Nathan and I both finished today. I had quite a good day; a few issues came up which I had to deal with in the absence of my team, but I managed to get quite a lot done. I even tidied my office before I left, which should put me in good stead for the return of the 'clear desk policy' next year. We had another lovely evening last night, as we went to Nathan's Nursery's little sing-along session. It was really sweet, with all the children lined up in their best after a day of fun and games ready to sing. Amusingly, Nathan saw me arrive and was instantly ready to go as he wanted to get at the toy dumper truck and chocolates he had been given by Father Christmas. This urge to leave was pretty unusual, as it normally feels as if we have to drag him away from whatever he is doing when we get there to pick him up. He absolutely loved the singing, and every time a song was introduced, he joined in straight away, not waiting for anyone else. He also led the solos! It was sweet. There are photos, and I may share some soon once I get them uploaded. This evening, we had to deploy the "We'll tell Santa not to come if you carry on misbehaving!" threat, as he has been getting increasingly boisterous and excited over the week. Fortunately, it does seem to have some weight and he's fast asleep now, as is Jill. I think that I should take that as a hint for me too. Catch you all soon! Tonight was one of those special nights, as Jill and I took Nathan to see Santa Claus. He was a little bit excited when we told him what we planned, but not to the point of being boisterous. We set out after dark had fallen, with the moon low in the sky and one of the planets bright below it (possibly Neptune according to Starmap Pro). The roads were still pretty treacherous, but fortunately, it was only a short journey to Stockeld Park where "A Christmas Adventure" was being held. It's a local farm estate which has added a big Christmas shop, cafe, Grotto, skiing & skating, and an "Enchanted Wood" light show. It was bitterly cold (as we left, the car thermometer soon dropped to -2C), but we wrapped up well. The queue for Santa was far shorter than the forty minutes that the ticket sales people had said, and we soon reached its head. Nathan was refusing to have his photo taken at all, almost treating me as if I was one of the paparazzi, meaning that the cameras that Jill had brought were all for nothing. Nathan was a bit scared by Santa's Elves, two young and friendly women, and hid behind our legs. However, talk of 'Thomas the Tank Engine' drew him out a little and then it was time to go and see Father Christmas himself. When we got in the room, Nathan was still a little scared, but he answered questions and promised to be good for his Mummy and Daddy (ho! ho! ho!) before he was given a small present by Santa. We think he enjoyed it and it was magical to watch him. After we left the Grotto, we passed through the gift shop where we had the amusement of Nathan trying to get the attention of another lady in a similar purple coat to the one that Jill was wearing and then discovering that it wasn't "Mummy" and rushing back to me, who he had been ignoring up until that point. After a quick bite to eat, we headed back out into the cold and the "Enchanted Wood". This was done beautifully, with animated events and gorgeous lighting. It was almost worth a visit for the opportunity to take pictures alone, but I didn't give in to that temptation as it was far too cold! Nathan insisted in walking all the way, a long distance, and seemed to love it. All in all, it was a magical, enjoyable and, above all things, cold night! A You-Tube video I pulled together using the Flip Video Camcorder at Furnace 2009. Very Vox-Pop; perhaps I should have edited myself out? I’m pleased with the outcome, although it could do with a little space either side of each cut. The editing was done with the Flipshare software.